The hazards of drunk driving to the lives of people in cars are well-understood. Still, not all individuals involved with alcohol-related fatalities are behind the wheel, or even in a car at all. 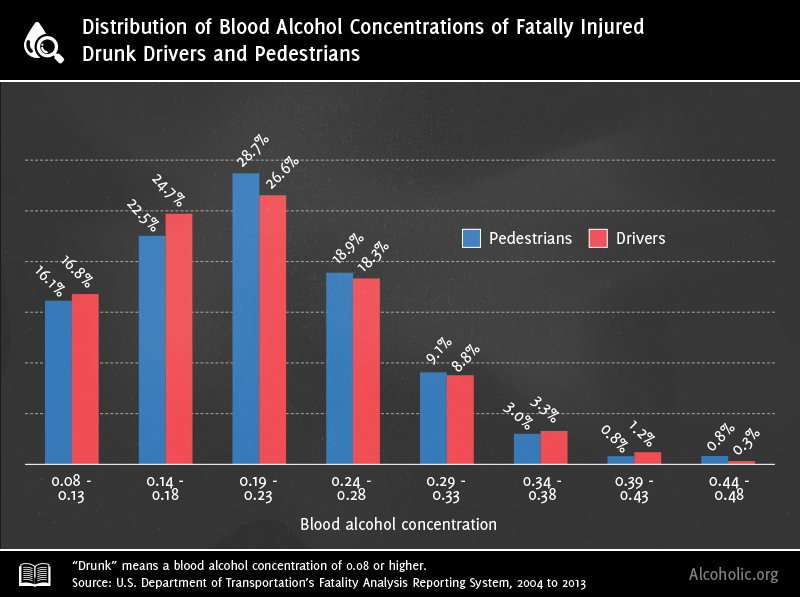 Data from the U.S. Department of Transportation suggest that alcohol might play a significant, if not bigger role in the traffic deaths of pedestrians. We’ve analyzed figures spanning more than 30 years to compare the dangers of driving drunk with walking drunk. Our data come from the U.S. Department of Transportation’s Fatality Analysis Reporting System (FARS), which has been tracking the who, what, where, when, and why of traffic deaths since 1975. For this project, we’ve divided the “who” into two main groups – drivers and pedestrians – and subdivided those into drunk and non-drunk deaths to create four distinct categories of crash victims. “Drunk” means that an individual had a blood alcohol concentration (BAC) of 0.08 grams of alcohol or above per 100 grams of blood when they died, which is a crime in all 50 states (for drivers, not pedestrians). “Non-drunk” means that they were sober, or otherwise under the 0.08 limit. The first point to notice about driver versus pedestrian traffic deaths is that understandably drivers are killed at a far higher rate. In 2013 – the most recent year for which full data are available through FARS – almost five times more drivers died in road traffic accidents than pedestrians: 20,871 versus 4,434.1 The story changes when we look at what percentage of those two groups of people were drunk when they died. Given that walking and driving are two quite different activities, perhaps intoxicated pedestrians are much drunker than drivers when they are killed, which could explain why they are on foot in the first place rather than driving. FARS allows us to check this theory using BAC values collected by police forces across the country. When a person has a BAC below the legal limit for driving (say, 0.03 to 0.059), they can expect to feel more relaxed and talkative. However, as soon as they go above 0.08, the behavioral changes caused by the alcohol lead to noticeable and dangerous cognitive and physical impairments, including decreases in reasoning ability, depth perception, peripheral vision, and glare recovery.2 Every one of these faculties plays an important role in safe driving and walking. When we compare thousands of drunk driver and drunk pedestrian traffic death reports compiled between 2004 and 2013, we can see the distribution of BAC values is extremely similar for both groups. What’s alarming is that the majority of values are not just slightly over the legal limit; they are in fact in the 0.19 to 0.23 range. The side effects of being this drunk, as mentioned above, include severe motor impairment and stupor, which is defined as “the strong possibility of near-unconsciousness” – just about the last thing you want to see in a person who is behind the wheel or about to cross the street. As with all forms of substance abuse, the potential harms of excessive alcohol use rarely affect the intoxicated individual in isolation. Those around them – both in terms of physical proximity as well as social, or family connectivity – can also pay a price. If the consequences of compulsive alcohol use are becoming increasingly problematic, substance abuse treatment may provide much needed support. Call 1-888-893-7018 to speak with an advisor about alcohol rehabilitation options today. 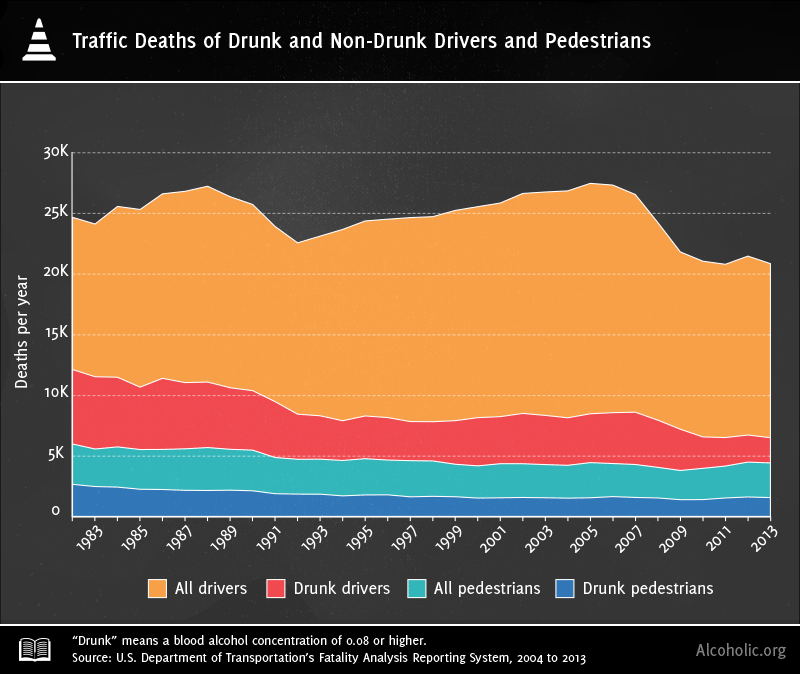 We now have answers to some of the “what” questions: Many more drivers die on the roads each year than pedestrians, but proportionally more of the pedestrians are drunk than the drivers. 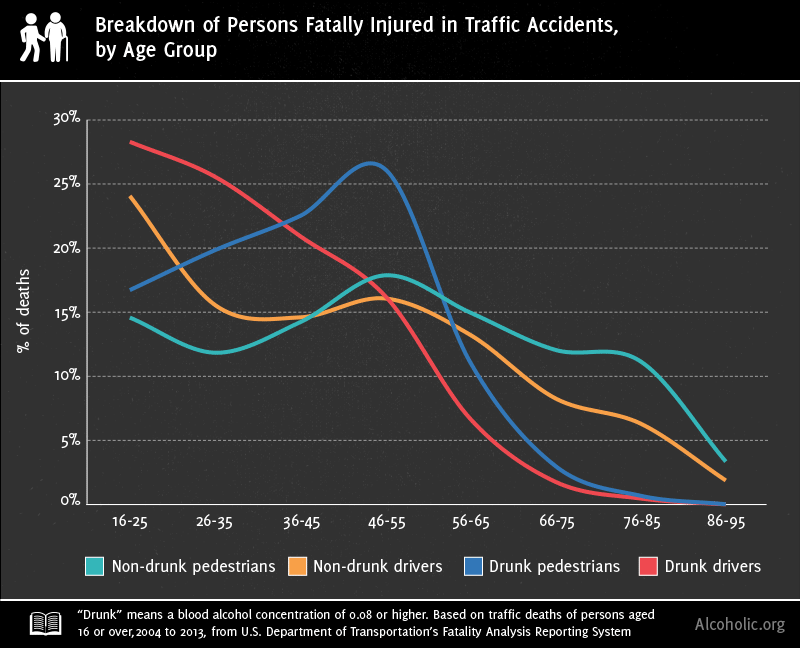 And both groups show a similar distribution of how drunk they are when they are fatally injured. 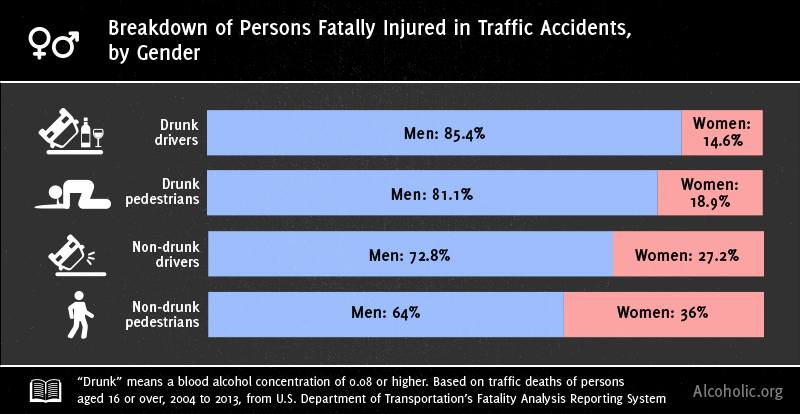 Let’s turn our attention to the broadest “who” question: How do traffic deaths differ by gender? In 2013, 70% of drivers killed in accidents were men.3 This massive gender gap is partly due to men driving more miles than women, but men are also more likely to engage in risky driving practices such as not wearing seat belts, speeding, and – of course – drunk driving. Between 2004 and 2013, 85.4% of drunk drivers killed were men. The figure was similar for drunk pedestrians: 81.1%. Among our four categories, the one with the closest gender parity is non-drunk pedestrians, of whom 64% were men. 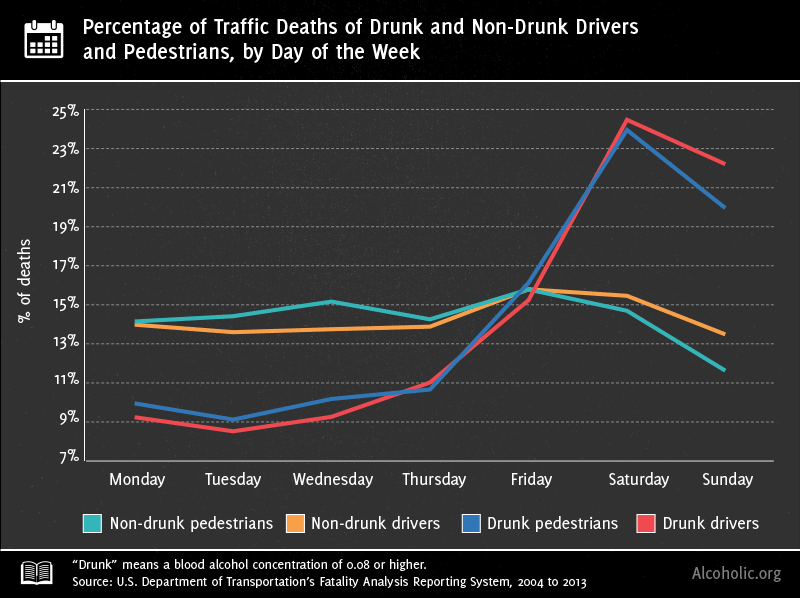 The graph above shows that an almost identical proportion of drunk drivers and pedestrians die on each day of the week, with a huge spike on Saturday (which technically includes people who start drinking on Friday night and continue into Saturday morning). In contrast, the distribution for non-drunk drivers and pedestrians is relatively even across the week, because non–alcohol related factors that cause crashes, like driver inattention, remain constant. A bigger gap appears between drivers and pedestrians when we look at what time of day their deaths occur. The highest proportion of deaths for drunk drivers happens at 2 a.m., when they pile into cars to go home. For drunk pedestrians, it’s a good deal earlier in the evening, at 9 p.m., with another spike noticeable at 2 a.m. (presumably because of the drunk drivers). 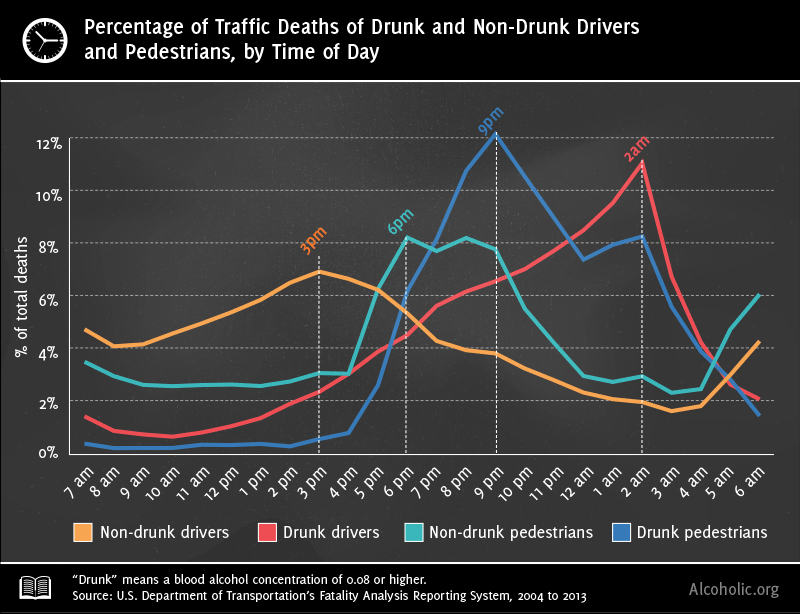 Less difference in timing exists between non-drunk drivers and pedestrians. The worst time for the former is 3 p.m., and the worst for pedestrians is 6 p.m., when many people are on the road commuting for work. So, more cars on the roads and more drunk people in them both increase the rate of traffic deaths for drivers and walkers. Visibility presumably makes a difference too, especially to pedestrians, who generally don’t come equipped with headlights. And, apart from the hour of day, the time of year is the biggest factor in whether or not it’s dark at any given moment. Common sense would suggest that driving fatalities should be highest in winter, when weather conditions tend to be at their worst. However, the data show the opposite. 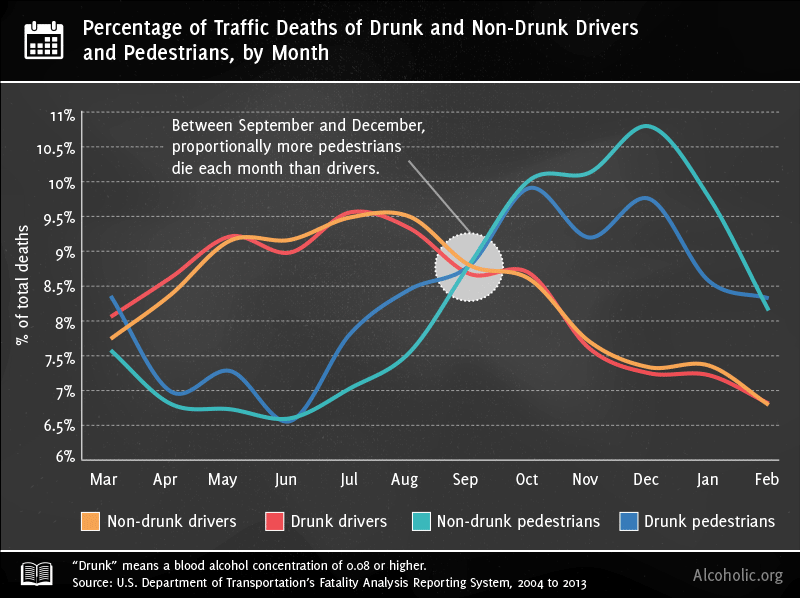 The most dangerous season for drivers (whether or not they’re drunk) is summer, when the roads fill with people wanting to take advantage of longer daylight hours and drier conditions, many of whom are holiday travelers.4 It’s the opposite story for pedestrians, who see the highest rates of fatal injuries after September, in the darker winter months. In fact, the FARS data allow us to examine lighting conditions in even more detail, because police reports specifically record environmental conditions. Splitting traffic deaths by lighting conditions demonstrates how instrumental visibility, or a lack of it, is in causing pedestrian deaths. Between 2004 and 2013, 64.4% of non-drunk drivers died in the daylight; but for non-drunk pedestrians, the figure was about half of that, at 32.8%. Put another way, 62.5% of non-drunk pedestrians died in dark conditions (lighted and not lighted), compared with 30.9% of non-drunk drivers. For pedestrians, even more so than drivers, darkness is dangerous. 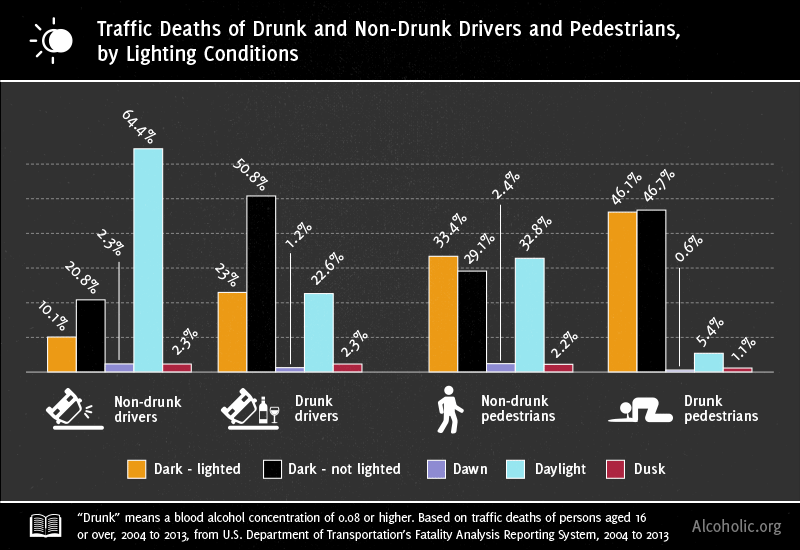 And it’s especially dangerous when combined with drunkenness: 92.8% of drunk pedestrians died in dark conditions (split almost 50/50 between “dark - lighted” and “dark - not lighted”). 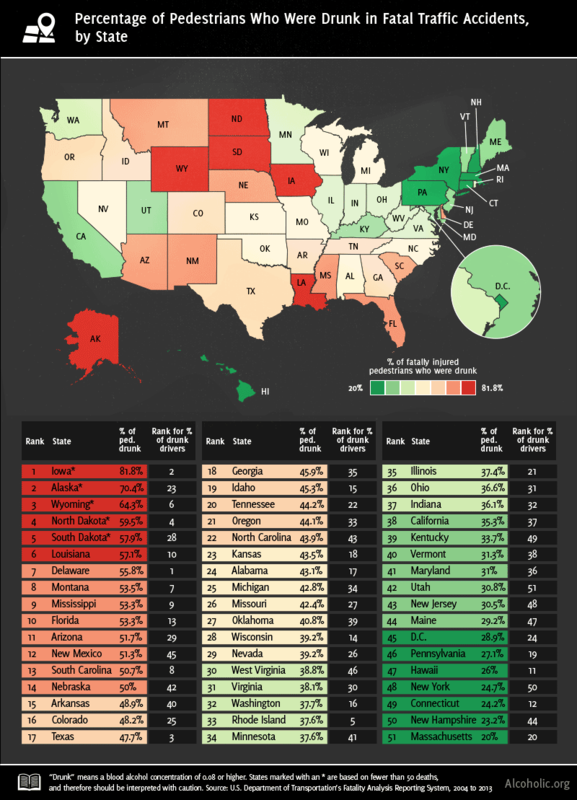 There are a few different ways to compare drunk driving and drunk walking by state. One is to calculate the number of drunk driving deaths per 100,000 residents. Another is to compare per capita alcohol-related arrests. A third, and the one we’ve chosen to focus on above and below, is to look at what percentage of persons who died in traffic accidents were above the legal alcohol limit. We’ve already seen that in 2013, 31% of drivers killed in crashes had BACs of 0.08 or higher. 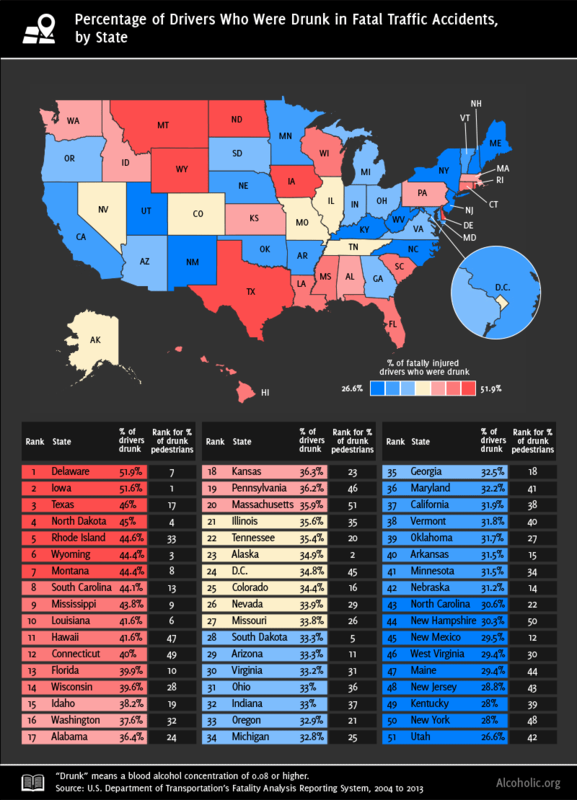 The rankings above, which cover 2004 to 2013, show how much certain states deviate from this average. In Delaware and Iowa, in first and second places, just over half of the drivers killed in the time period covered were legally drunk. In Utah, however, where drinking laws are relatively strict, 26.6% of drivers – or about 1 in 4 – were drunk when they died. More generally, we can see that there were higher rates of intoxication among fatally injured drivers in the South and Northern Rockies. Is the same true for drunk pedestrians? Two reasons make it more difficult to establish definitive rankings for state-level intoxication among fatally injured pedestrians than for drivers. First, certain states test deceased pedestrians’ BACs at higher rates than others. Second, smaller states have far fewer pedestrian deaths than the larger ones, which means there are fewer data to work with. 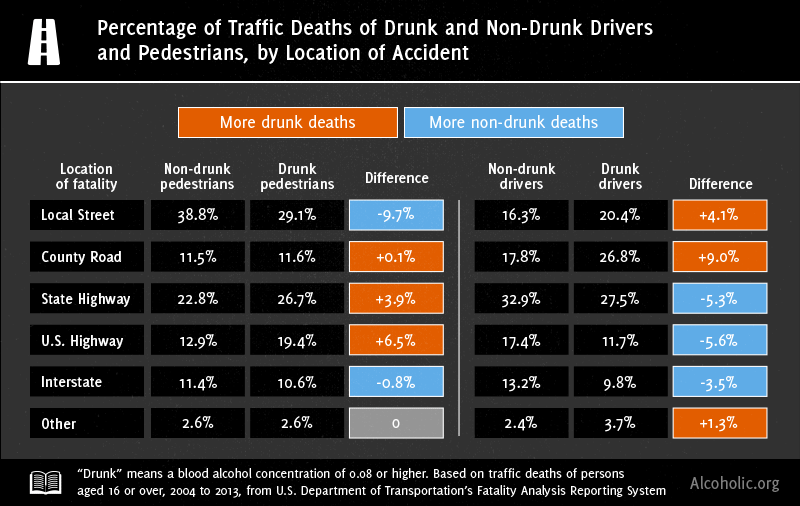 The rates for the top five states in the chart above are all based on fewer than 50 pedestrian deaths each, which is why we have to remain skeptical when we see that 81.8% of fatally injured pedestrians in Iowa between 2004 and 2013 were legally drunk, even if Iowa did rank second-highest for intoxication levels among drunk drivers (for which the data are much more reliable). The same goes for Wyoming and North Dakota, which also appear in both top 10 lists. There’s more certainty for states such as Florida, which had enough pedestrian deaths in the 10 years covered for its intoxication rate of 53.3% to really mean something. Likewise, New York, which was fourth-lowest in the nation, also stands out. If you'd like to read more about New York City in particular, please feel free to review some additional findings here. The final “where” question we’ll address is also the most specific. The table above shows how traffic deaths for our four groups were distributed between six road types. The key information here is how the rates differ between non-drunk and drunk persons. For instance, 17.8% of non-drunk drivers between 2004 and 2013 died on county roads, but for drunk drivers, the proportion was 9 percentage points higher, at 26.8%. 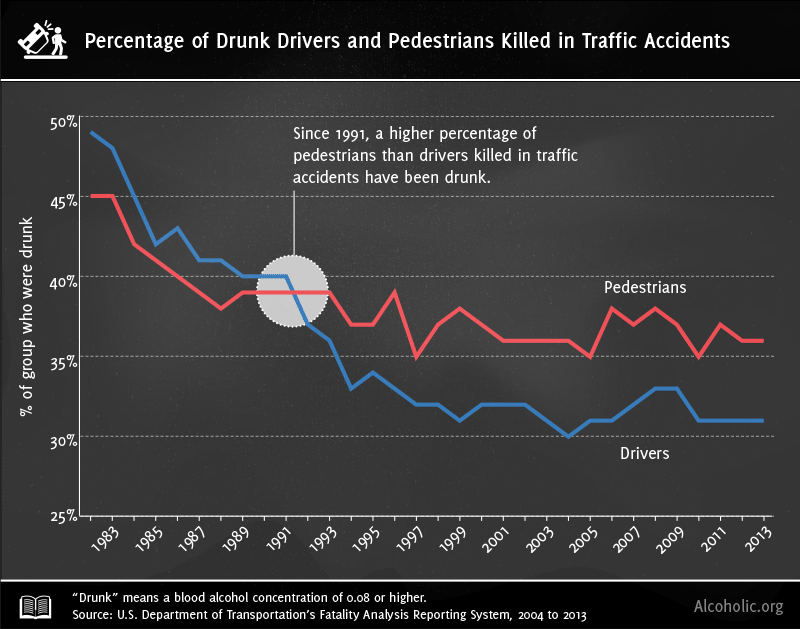 For pedestrians, the biggest difference is seen on U.S. highways, where 6.5 percent more drunk than non-drunk pedestrians were fatally injured. That last point is arguably the hardest for most pedestrians to follow, given that some amount of walking is always necessary to get from point A to point B. There’s also an irony at play: The more successful anti–drunk driving campaigns are in persuading people to walk home, the more inebriated pedestrians there are to potentially get injured or killed in accidents. In response to this threat, the NHTSA, in 2013, made $2 million of grants available to 22 cities that have higher-than-average pedestrian death rates.6 Ultimately though, it’s up to people on foot to keep in mind that liquid courage and darkness are a dangerous combination – and one that’s made even more deadly by drunk drivers, who, despite decreasing in recent years, remain a major threat to life. Preliminary data show that one-third of traffic deaths in 2014 were caused by drunk driving, which amounted to 9,967 lives.7 Figures like these underscore how important it is to play it safe – by staying off the road when you know you’ve had a few too many, or perhaps by not drinking so much to begin with. Maneuvering safely through an uncontrollable environment is tougher than it would seem – especially at night, and absolutely when intoxicated.